YC_Y_U_NO Give Twitter Link Readers Auto-Entry Into YC? 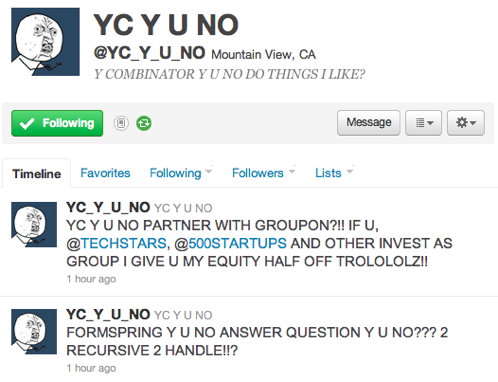 A couple weeks back, I noticed an amusing Twitter account called YC_Y_U_NO that poked fun at Y Combinator and Silicon Valley in general, sometimes with pretty hilarious results. The account is a riff on the popular Y U NO Twitter presence, which is itself based on the popular Y U NO meme featuring the Y U NO guy. As it turns out, YC_Y_U_NO was created by a trio of YC hopefuls — Wesley Zhao, Dan Shipper, and Ajay Mehta — who will be interviewing this weekend for a spot with the selective startup incubator. The startup recently launched a project called Readstream, and, while it’s still very early, it’s not bad for a few day’s work. The app in its current form is very simple: authenticate with your Twitter account, and Readstream will present an excerpt of the most recent link to appear in your Twitter stream (e.g. if someone tweeted a link to a TechCrunch article, you’ll see an excerpt). Click the arrow button, and you’ll see the excerpt of the next most recent link (you can also jump between other recently-tweeted links using the right sidebar). As you read each excerpt, the site fetches and caches more stories, so you can jump smoothly between the links. It’s nice, but it isn’t especially novel: there are some much more polished services, like Flipboard, Trove, and the recently-launched News.me that also present stories based on your social network feeds. 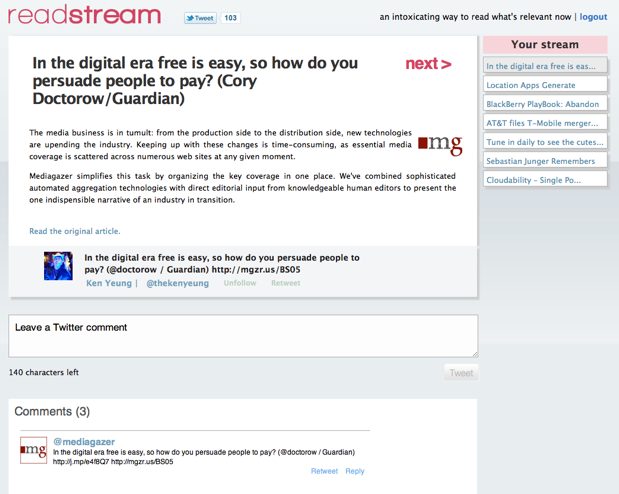 The twist, says Wesley Zhao, is that Readstream will eventually allow you to manually tweak the algorithm. For example, in the future he says you’ll be able to flip switches that let you toggle stories that are popular within a) just your social stream or b) the entire Twitter ecosystem. Zhao says that none of the other services give users granular control over their recommendation algorithms, and he thinks they’ll want it (he compares the controls they plan to those featured on Hipmunk). Of course, this is all still a long ways off. They’re still prepping for their YC interview. Oh, and in regards to YC_Y_U_NO…we created that at 6AM after Ajay came down to Philly to discuss our plans for the YC interview. We were a little dazed after staying up all night and in our stupor thought it would be funny to create a parody account based off the Y U NO meme. Also amusing: Zhao and Mehta met the team’s technical lead, Dan Shipper, after Shipper hacked their site PennMatch. The team has since launched Wheremyfriends.be (an animated map of your Facebook friends) and Grim Tweeper, a simple game inviting you to unfollow people on Twitter.